There are four recognised species of modern-day South American anteater – or vermilinguan, to be taxonomically precise (the unrelated aardvark, the pangolins, and the echidnas are all sometimes referred to colloquially as anteaters too – respectively, the African anteater, the scaly anteaters, and the spiny anteaters). These are: the giant anteater Myrmecophaga tridactyla; the pygmy or silky anteater Cyclopes didactylus; and somewhat midway in size between these two species, the northern tamandua Tamandua mexicana and the southern tamandua T. tetradactyla (these two were previously lumped together as a single species, the tamandua T. tetradactyla). Each of the two tamandua species is itself split into four subspecies, and although the most familiar appearance in both species is one in which the animal possesses a black vest-like coat pattern over its torso, with the remainder of its body and also its head of paler colouration, there is much variation in both coat colour and pattern. Variation notwithstanding, however, no tamandua had ever been reported before (or, indeed, has been since) that even remotely resembled a certain extraordinary specimen sent during the 1700s to the pre-eminent French naturalist Georges-Louis Leclerc, Comte de Buffon (1707-1788), for examination. What made it unique was that, totally eschewing the traditional 'black vest vs paler elsewhere' tamandua image noted above, this particular individual was very distinctively patterned all over its body, legs, tail, and even its long snout with bold, highly contrasting black and gold stripes! Needless to say, Buffon was captivated by this veritable bumblebee in anteater form, and in 1763 he duly incorporated it as a major new species, the striped tamandua, in his monumental, 36-volume magnum opus, Histoire Naturelle (1749-1788) (NB - one of the southern tamandua's four subspecies is also referred to sometimes as the striped tamandua, but it bears no resemblance to the singular specimen documented here, so it should not be confused with this latter animal). He even commissioned a full-colour plate for his Histoire Naturelle, portraying his striped tamandua there in all its banded beauty, which is the image opening this present ShukerNature post, and to my knowledge the only depiction of this creature ever produced. 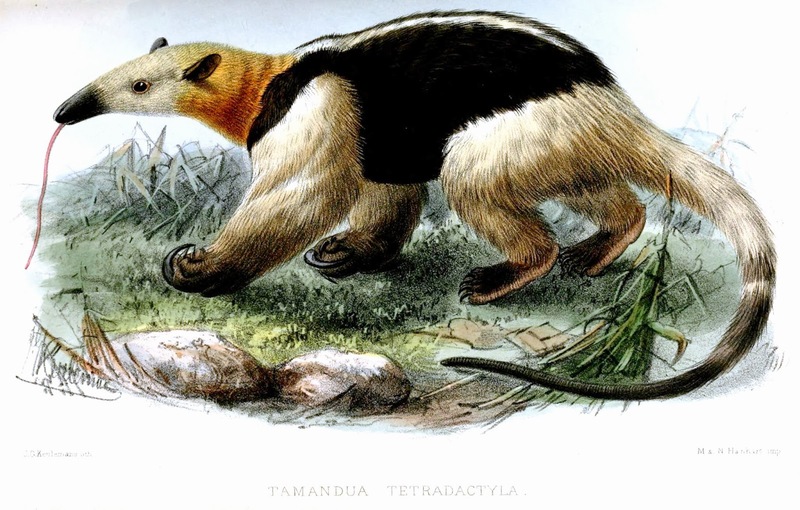 Tragically for Buffon's reputation, however, when the striped tamandua's holotype was examined by other zoologists after his death, it was discovered that he had been the victim of a cunning hoax. 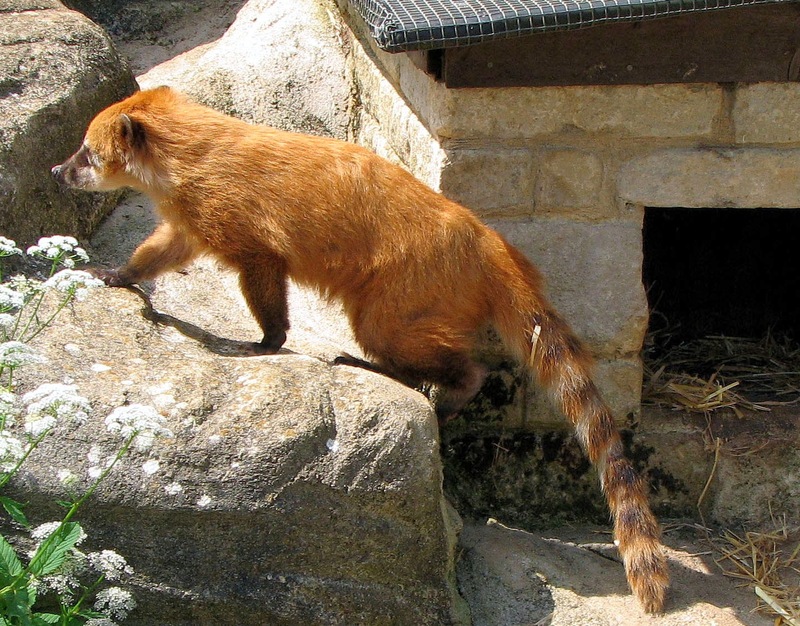 The creature was not a tamandua at all, but was instead a coati – a long-nosed relative of the raccoons, occurring in three recognised species – which had been deftly modified to resemble an anteater (even its teeth had been removed), and whose stripes were equally artificial. The perpetrator of this cruel practical joke was never identified, but once their hoax had been exposed, the now-fraudulent striped tamandua made a swift, unmourned exit from the natural history tomes, never to return. In yesterday's ShukerNature blog post (click here), I presented a selection of speckle-coated mystery big cats reported from various parts of South America. Now, less than a day later, I'm able to present a very unexpected but fascinating update to this subject. As so often happens during my cryptozoological researches, while seeking something entirely different while browsing online this morning I came upon a remarkable engraving that may have some bearing upon the speckled mystery cat saga. 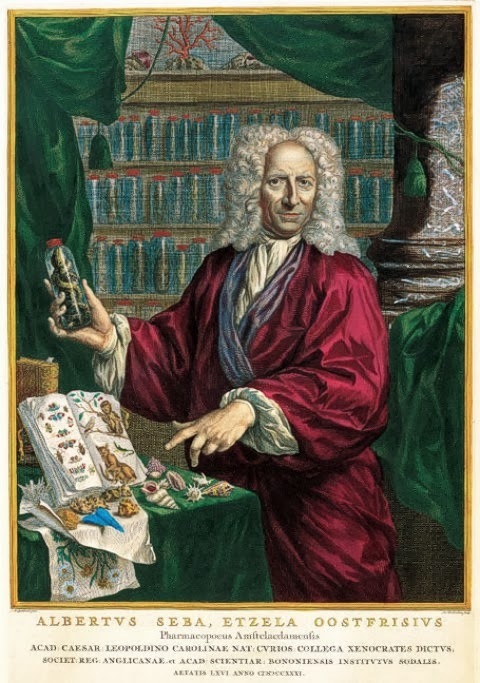 Albertus Seba (1665-1736), a Dutch pharmacist by trade but inflamed by an unquenchable passion for collecting zoological specimens, was so successful financially in his work that he was able to assemble not one but two truly spectacular, prodigious collections of unprecedented size and scope that gained international acclaim. Indeed, the first of these collections was so astonishing that in 1716 it was purchased in its entirety by no less a celebrated figure than the Russian tsar Peter the Great; the second was auctioned in 1752 in Amsterdam, and several prize specimens were purchased by what was then the St Petersburg Academy of Sciences, founded by Peter the Great (but merging in 1841 with the Russian Academy to become the present-day Russian Academy of Sciences). Perhaps Seba's most lasting claim to fame, however, is his magnificent four-volume Thesaurus (published 1734-1765). Its full, dual Dutch-Latin title is Locupletissimi rerum naturalium thesauri accurata descriptio – Naaukeurige beschryving van het schatryke kabinet der voornaamste seldzaamheden der natuur, which translates as 'Accurate description of the very rich thesaurus of the principal and rarest natural objects', and it is basically an exquisitely-illustrated catalogue of every zoological specimen that Seba had collected, containing 446 full-colour folio-sized copper plates. A copy of this wondrous work sold at auction a few years ago for the staggering sum of US $460,000. However, a modern reproduction compendium of all of its colour plates (but not containing Seba's accompanying text descriptions of the specimens in Latin and French), entitled Cabinet of Natural Curiosities and compiled by Irmgard Müsch, Jes Rust, and Rainer Willmann, was published by Taschen in 2001, followed by further printings more recently. Purchased directly from Taschen, a hardback copy currently costs £125 (remarkably, however, it only costs £18.75 on Amazon!!). According to the description given for the plate, these cats were tigers! I am not sure whether this identification is the original one given by Seba in his Thesaurus, or is simply one hazarded by the owner of the website containing the scans, but what I am sure of is that whatever these pale-furred, liberally spotted cats may be, they are certainly not the orange-furred, unequivocally -big cat that we all know as the tiger, unless...? What if the term 'tiger' was being used here not in relation to Panthera tigris, but rather in its Latin American meaning, i.e. 'jaguar'? 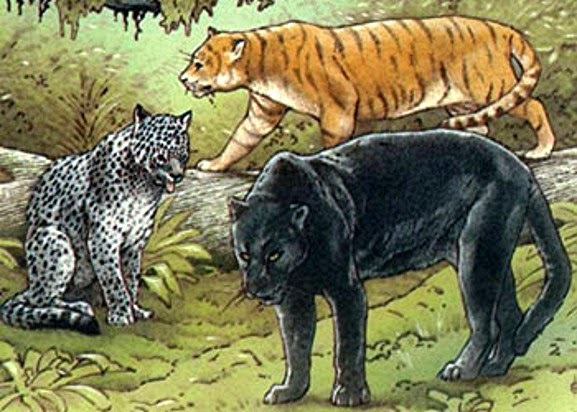 Yet these illustrated cats possess no trace of the jaguar's normal rosettes and they lack its fur's deep orange background colouration too, being patterned all over instead with an array of solid black dots or speckles upon a virtually white background - thereby greatly resembling the alleged appearance of Peru's speckled tiger aka Anomalous jaguar. As one of the greatest zoological collectors of all time, if anyone were likely to obtain specimens of this most exotic, elusive form of South American crypto-cat, Seba would have to be a primary candidate for achieving such a feat. Needless to say, I realise that this is all highly speculative. It may simply be that the two cats are very inaccurate representations of normal jaguars, or even leopards, such as the pale-coated Arabian leopard Panthera pardus nimr (their non-gracile body proportions and lack of teardrop facial markings argue strongly against their being cheetahs). Yet in view of how accurate other depictions of animals are in Seba's Thesaurus, this seems strange. In any event, they are certainly tantalising enough in appearance to warrant inclusion in any coverage of speckled mystery cats, just in case they are relevant and any further investigation of them can be achieved. So if anyone reading this ShukerNature blog post should happen to own a modern-day Taschen compendium of the Seba Thesaurus's plates, I would very greatly welcome any news of what identity was given in it for these two speckle-coated big cats. Thanks very much! A few days ago, I gave in to temptation and purchased online a copy of the 2011 reprint of Taschen's modern-day reproduction compendium of this tome's sumptuous colour plates, which arrived today. I swiftly turned to the speckled cats plate, and discovered to my great surprise that they were labelled as...cheetahs! Anything less like cheetahs than these two felids would be hard to imagine, as they have the body proportions of a leopard or jaguar and lack the cheetah's characteristic facial teardrop marks. Only their speckled pelage is cheetah-like. Consequently, I can only assume that either the Taschen compendium's German compilers are mistaken in their identification, or the 18th-Century artist responsible for the original plate versions in Seba's Thesaurus did not draw them from life, or from accurately prepared taxiderm specimens either. Thanks also to Facebook friend Robert Hodge, who checked through his own copy of Taschen's plates compendium from Seba's Thesaurus while mine was en route and duly informed me that they were indeed labelled in it as cheetahs. Another mystery solved, albeit in a very disappointing, anticlimactic manner. I was pleased to learn yesterday that the long-awaited paper that I obliquely alluded to in my book Cats of Magic, Mythology, and Mystery (2012), providing an extensive morphometric analysis of two skulls from two different types of Peruvian mystery big cat, has finally been published (click here to access it). It is co-authored by British palaeontologist Dr Darren Naish, who also has a longstanding interest in cryptozoology. The two mystery cats whose skulls are featured in the analysis are what another of this paper's four co-authors, Peru-based zoologist Dr Peter J. Hocking (who also obtained the skulls), originally called the speckled tiger ('tiger' being a prevalent term throughout Latin America for the jaguar Panthera onca) but which is renamed the Anomalous jaguar in the paper, and what Hocking originally called the striped tiger but which is renamed the Peruvian tiger in the paper. Based upon the results of the analysis, in which both skulls were shown to fall within the documented range for the jaguar, the paper's authors conclude that these specimens were indeed jaguars, but ones that exhibited aberrant pelage markings. Even more intriguing [than the Peruvian giant black panther or yana puma, which was the first of the four to be documented by me in my book] is the 'speckled tiger' - claimed by locals to be as big as a jaguar (jaguars, incidentally, are popularly termed 'tigers' in South America), but with a larger head, and a unique pelage consisting of a grey background covered with solid black speckles. There is no known species of South American cat alive today that fits this description - so what could this mottled mystery cat from the montane tropical forests of Peru's Pasco province be? 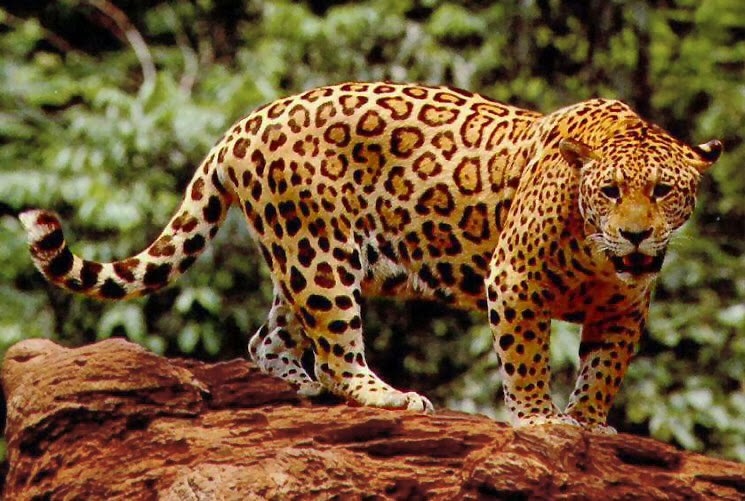 A jaguar with a freak coat pattern and colouration is the most reasonable explanation, but this poses problems. The pelage of a complete albino jaguar (i.e. homozygous for the complete albino mutant allele of the Full Colour gene) would have white background colouration and normal but white rosettes visible only in certain lights, like watered silk; and even a chinchilla-reminiscent specimen (analogous or homologous to the white lions of Timbavati and/or the white tigers of Rewa) would have normal rosettes, probably grey or pale brown. So too would a leucistic specimen (see Chapter 3). 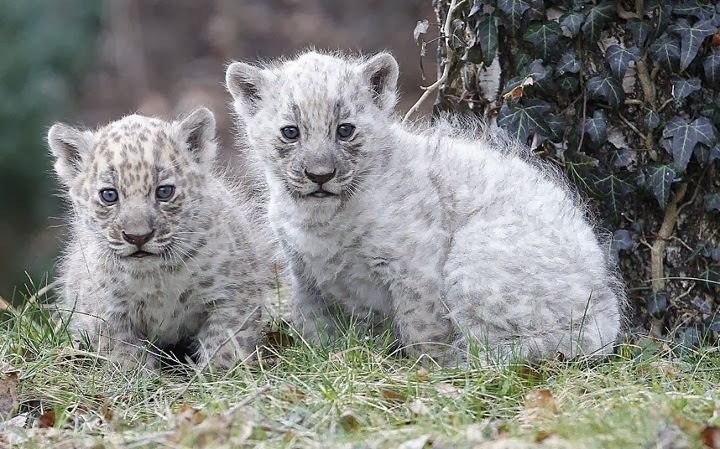 Interestingly, on 19 January 2012, two white jaguar cubs with pale grey rosettes and normal green eyes were born to a typical rosetted father and a melanistic mother at Aschersleben Zoo, in Germany; the first white jaguars born in captivity as far as is known, they are most probably leucistic, as indicated by their normal eye colour and the pale, washed-out appearance of their coat. Genetically, the presence of solid black speckles reported for Peru's 'speckled tiger' rather than well-formed rosettes is anomalous. 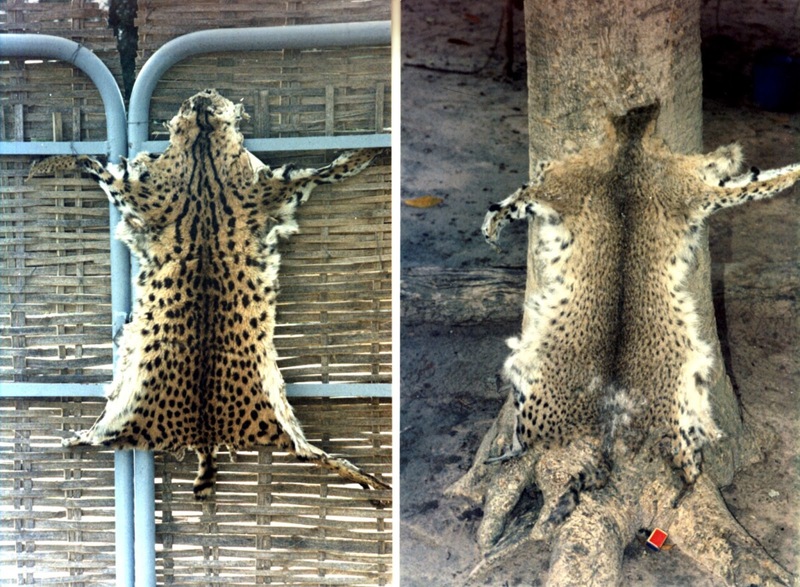 The only comparable case is that of the speckled servaline morph of the serval Leptailurus serval (see Chapter 27), and a couple of servaline-like cheetahs that I have dubbed cheetalines (see Chapter 19). The cunarid din is quite like the ticar din [normal jaguar], except that the ground colour is nearer white than orange or yellow. The Indians say that the white kind always attain a much larger size than the former, but this is doubtful as a fact. The spots are often finer on the fore quarters and spaced further apart, and there are noticeably fewer spots within the rosettes along the sides of the body, giving the skin a rather leopard-like appearance. Moreover, while browsing through a copy of Scottish naturalist Sir William Jardine’s classic Natural History of the Felinae (1834) recently, I was startled to discover a colour plate of a very odd-looking jaguar - whose paler-than-normal coat lacked this species’ familiar, clearly-defined rosettes and instead was patterned entirely with a heterogeneous array of solid black speckles and blotches. 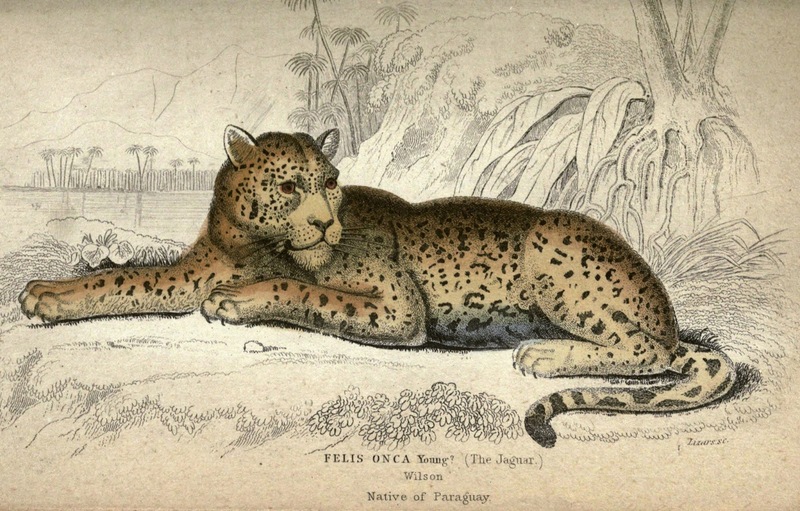 According to the plate’s caption, this jaguar was a native of Paraguay. 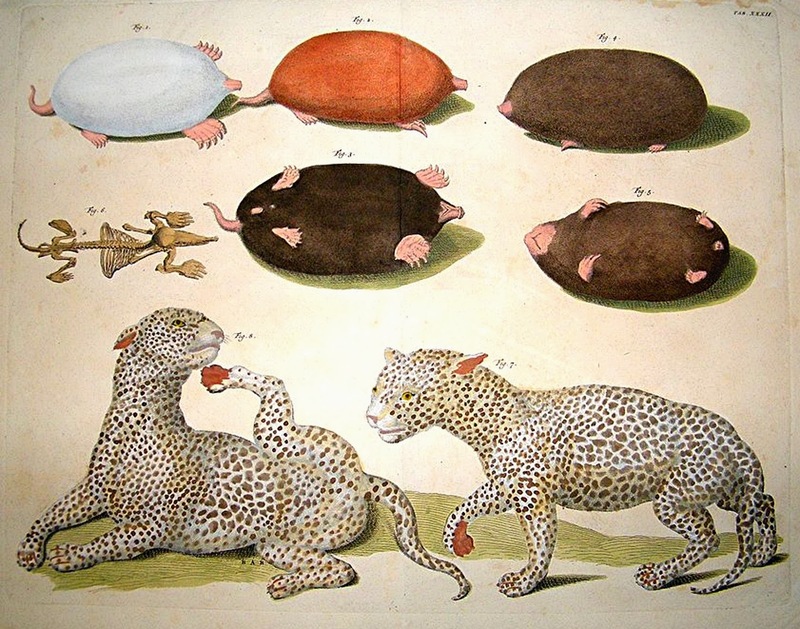 Consequently, always assuming of course that it had been depicted accurately, this suggests that speckled jaguars or jaguar-like cats have also occurred here in the past. Perhaps they may still do so today. The Anomalous jaguar's speckled pelage may be due to the expression of a homologous, or at least an analogous, mutant gene allele to that which creates the speckled serval and/or speckled cheetah morphs. 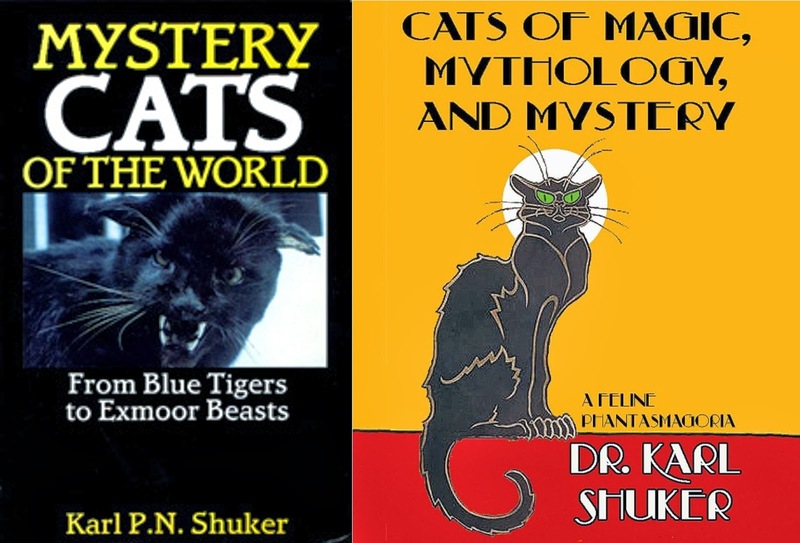 For plenty of additional information concerning a wide diversity of South American mystery cats, be sure to check out my two mystery cat books – Mystery Cats of the World (1989) and Cats of Magic, Mythology, and Mystery (2012). Of all of my 20 books, none has attracted such acclaim but also such controversy as In Search of Prehistoric Survivors. Next year will mark the 20th anniversary of its original publication in 1995, and having received countless requests from readers over the years for its republication (after having been out of print for a number of years now), I am happy to say that following a protracted period of time doing the rounds of prospective publishers, it was accepted for publication just over a year ago, and I am working upon it with a view to its achieving a timely 2015 reappearance. Having said that, I am still uncertain as to whether to prepare a straight reprint of the text but with additional illustrations (courtesy of the many wonderful ones that have become available to me since 1995), or whether to update it – and, if I do, how extensive that update should be. Mindful of the book's enormous scope of cryptids (the only major group not represented in it are the man-beasts, and that itself was only for reasons of limited space), a major update would see the book's size grow dramatically, to the point where it might simply be financially unviable to produce it. So I need to reflect further upon that. Nevertheless, after having received so many enquiries, I can definitely confirm that Prehistoric Survivors will be returning, so watch this space! Meanwhile, and after having given the matter much thought, I feel that it may be instructive to reveal precisely how this particular book of mine came to be, because ever since it appeared in 1995 there has been a degree of confusion and controversy in some quarters as to where I stand in relation to its theme and contents. Consequently, I hope that the following explanation (which I have already outlined privately to various colleagues down through the years but have never got around to disclosing publicly before) elucidates all of this satisfactorily. In many ways, this book is the most unusual of any of mine, inasmuch as its final, published form was not how I had originally conceived it at all. Let me explain. Following the publication in 1991 of my second book, Extraordinary Animals Worldwide, I was planning a major book on herpetological cryptids – everything from alleged living dinosaurs, pterosaurs, and plesiosaurs, to mystery lizards of many kinds, giant snakes and crowing serpents, chelonian cryptids of all shapes and sizes, anomalous amphibians, and even a major section devoted to the possible origin of and inspiration for the world's plethora of legendary dragons. 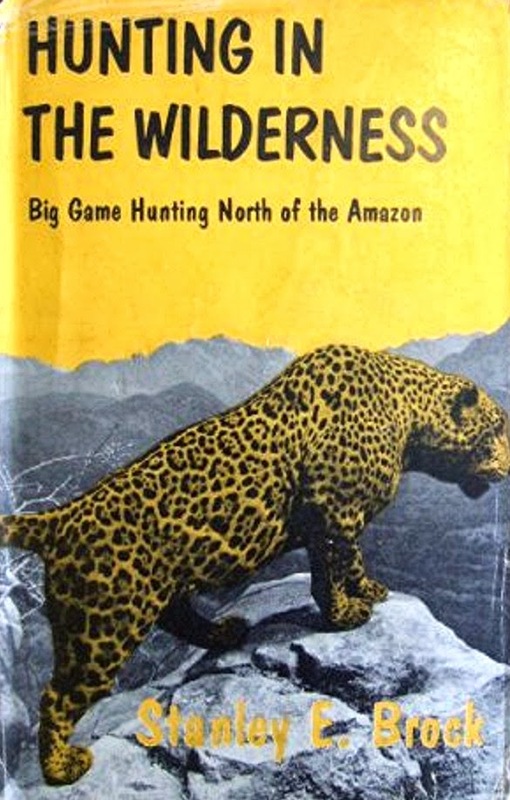 A synopsis of this proposed book did the rounds of publishers (during which time, incidentally, my third book, The Lost Ark: New and Rediscovered Animals of the 20th Century, was published, in late 1993), with Blandford Press being particularly interested in it (and ultimately publishing it two years later). Mindful, however, of the enormous worldwide popularity of Steven Spielberg's blockbuster movie Jurassic Park at that time (the first film had been released in 1993), they suggested a fundamental change to the contents and slant of my book. 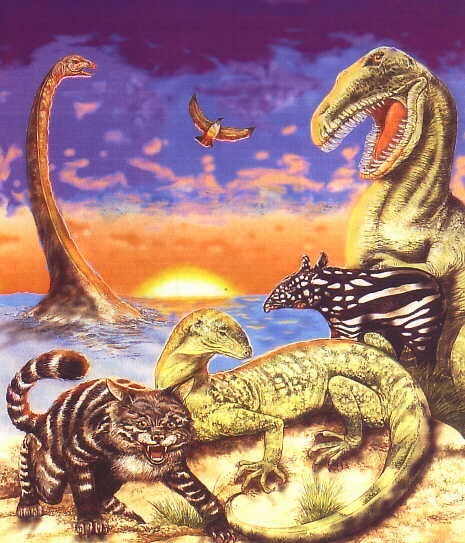 Instead of confining it to herpetological mystery beasts, they proposed that I should expand its range of subjects to that of cryptids spanning the entire zoological spectrum, but concentrate exclusively upon those that have been suggested at one time or another by cryptozoologists to constitute prehistoric survivors. It was certainly a most intriguing brief (albeit very different from my original concept), and one that I therefore decided to accept, even though – and I must emphasise this unequivocally here - I did not personally consider it likely that all of those cryptids truly were prehistoric survivors. But my personal opinion was irrelevant as far as the book's brief was concerned. What was required was for me to present for each cryptid a dossier of reports and native traditions, and then assess them in the context of whichever prehistoric creature(s) it had been likened to in the cryptozoological literature (with theories not appertaining to prehistoric survival receiving only minimal treatment, as they were not the focus of this study). So that is precisely what I did. Consequently, out went most of the mystery lizards and amphibians as well as the snakes and also the dragons section, and in came putative mammalian methuselahs like chalicotheres, thylacoleonids, amphicyonids, and sabre-tooths, alleged lingering avians like teratorns and Sylviornis, the giant carnivorous shark megalodon, and even some reputed eurypterid survivors. 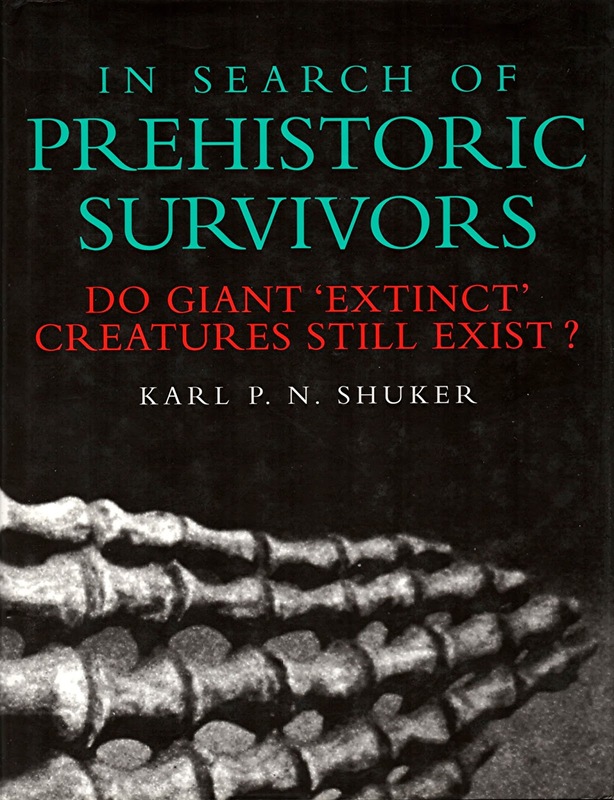 During the years that have followed, the concept of prehistoric survivorship – or what British palaeontologist Dr Darren Naish refers to as the Prehistoric Survivor Paradigm (PSP) - has received some harsh criticism from cryptozoological sceptics. And indeed, I am the first to concede that such survival becomes increasingly untenable the greater the span of time that exists between any modern-day cryptid and its most recent alleged fossil antecedents (i.e. its so-called ghost lineage, with the cryptid itself thereby constituting a Lazarus taxon). However, as my trilogy of books on new and rediscovered animals have disclosed time and again, some truly extraordinary, spectacular, and entirely unpredictable, unexpected zoological discoveries have been made in modern times. And yes, these do indeed include some bona fide prehistoric survivors, taxa known only from fossils until living representatives were unveiled - e.g. the Chacoan peccary, mountain pygmy possum, Bulmer's fruit bat, kha-nyou, goblin shark, neoglyphean crustaceans, monoplacophoran molluscs, and of course the coelacanth. (And yes again, I am well aware that post-Mesozoic coelacanth fossils are now known, but these were only uncovered and recognised for what they were after the discovery in 1938 of the living Latimeria, when the unexpected resurrection of this ancient lineage of fishes no doubt acted as a significant spur to palaeontologists to seek post-Mesozoic coelacanth fossils that they now knew must exist if suitably preserved, and which would help to close up what could now be seen to be a very extensive and therefore anomalous ghost lineage for these fishes; so at its time of discovery, the modern-day coelacanth was definitely a valid prehistoric survivor.) Hence I remain reluctant to discount PSP out of hand. Having said that, although I have often been accused of "believing" that a given cryptid is a particular type of prehistoric survivor, this is simply not true, for the simple reason that it is impossible to state definitely (although certain cryptozoologists habitually attempt to do so) what a given cryptid must be. Without tangible evidence to examine (and I am referring here to physical remains, not photographic evidence, which can be convincingly faked with alarming ease nowadays), all that can be done is pass a personal opinion as to how likely or unlikely a given identity appears to be. 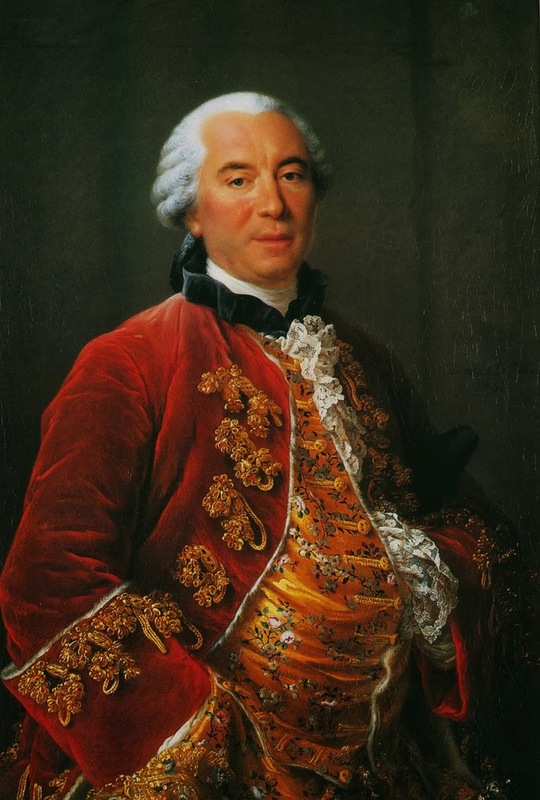 However, opinions are not facts, and should never be put forward, or be mistaken, as such. In short, therefore, I do not "believe" that any cryptid is any specific identity – I merely indicate what I personally consider to be likely (or unlikely) identities for it, nothing more. Reviving this book has posed something of a dilemma for me, because doing so meant that its original brief (and also therefore my own misgivings regarding the plausibility of prehistoric survival for certain of its cryptids) would remain fundamental to its raison d'être. The only alternative would be for me to rewrite it completely, with an entirely altered slant, but the result of that would be not only a totally different but also a much more extensive book – so extensive, in fact, that I sincerely doubt whether it would be financially viable for any publisher to take on. Yet whatever one's own personal opinion may be concerning prehistoric survival in any capacity, the wealth of historical reports and cryptozoological coverage presented in its pages is such that it would be a tragedy for this book to remain out of print, especially when – as I have been made continually aware for many years – there is a very considerable demand among readers for it to reappear. Consequently, now that I have outlined here how it came to be and why it is what it is, so that there can no longer be any confusion or contention regarding it, I am very happy to engage upon recalling back into existence what many people consider to be my finest cryptozoological volume. When complete, it may contain various updates and certainly some major new illustrations, but its basic context and content will otherwise remain unchanged. Last, but definitely not least, I wish to thank most sincerely all of its numerous supporters for their kind words through all the intervening years, urging me to resurrect it - just like a veritable prehistoric survivor itself, in fact!